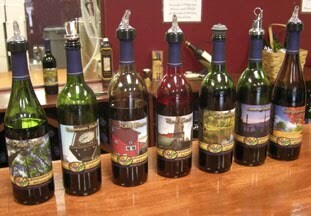 If you haven’t guessed already, one of our favorite wineries is the Adirondack Winery in Lake George, N.Y. We fell in love with their wine from the moment we tried it, and think the husband and wife owners are great inspirations to people who want to turn their passion into a dream job. So, we are always excited to share good news about the Adirondack Winery with our readers, and are please to share that the winery recently won three medals at the 2010 Indy International Wine Competition! Their Red Coat Reserve Merlot won a silver medal, while their Pinot Noir and Fireside Reserve port-style wine each earned a bronze medal. The few wines they entered were evaluated by 52 judges alongside nearly 2,700 other wines submitted by wineries across 15 countries. The winery’s Pinot Noir already holds a Silver Medal from the 2009 International Eastern Wine Competition. Since Adirondack Winery began entering select wine competitions in 2009, fifteen of its wines have earned 17 medals. “Each year, we enter a few of our wines in a small handful of wine competitions, so we are very pleased to earn one silver and two bronze medals for our wines when such steep competition is involved,” said Adirondack Winery President, Sasha Pardy. If you haven’t been to the winery on your trip to the Adirondacks, you must stop in for a tasting, and of course, remember to congratulate them on their three new medals!